Life sometimes gets in the way of creativity. All too easily, dreams can fall to the wayside amidst the churn of everyday responsibilities. But for three Georgia friends, persistence has resulted in a published book and a ticket to one of the biggest arts conventions in the world. Meet Steve Nedvidek, Jack Lowe, and Ed Crowell, the Atlanta-based authors of The Jekyll Island Chronicles: A Machine Age War, a graphic novel that combines diesel punk style with technological vision and fantasy. The story reimagines an alternate history for the time period between the World Wars. The scene is set on the tiny, real-life barrier island of Jekyll, located just off the Georgia coast. It’s a destination mostly known for by the industry titans like John D. Rockefeller and Andrew Carnegie who frequently vacationed there. 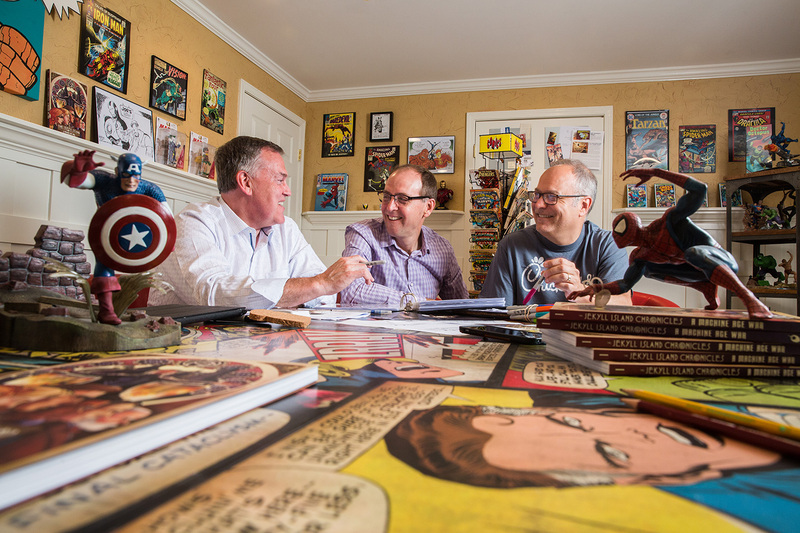 The 176-page book, released in May, is the first in a six-part series envisioned by the creators. If writing a book isn’t hard enough, imagine writing and illustrating one while juggling full-time jobs, families and other activities. Nedvidek teaches and coaches innovation in Atlanta at the corporate headquarters for Chick-fil-A, Inc—also known as the Support Center. Lowe handles culture and talent operations for Chick-fil-A, Inc, and Crowell is an executive at a large nonprofit organization. But all three said making time was critical in order to fulfill their creative dreams. “It has been a lot of hard work, but the rewards are tremendous,” he adds. Nedvidek, Lowe and Crowell’s friendship began more than 15 years ago. Over the years, as they gained mutual respect for their respective creative talents, the trio expressed interest in collaborating on a “passion project.” Nedvidek, a theatre major and avid cartoonist, first shared his idea for a story that would involve anarchists, early action heroes enhanced by technology, and the famous inventors/creators who lived between WWI and WWII. Lowe, a student of film-making, and Crowell, a writer with advanced degrees in political science and international affairs, committed to jump into the creative process. The friends formed a work group they called the “Lost Mountain Mechanicals,” named for the community where Lowe lives and Shakespeare’s reference to men who embark on something outside of their regular work. The team brainstormed the story arc and began to contemplate what it might look like as a graphic novel (i.e., a glorified comic book). The collaboration made sense. Crowell was a writer with a passion for science fiction and fantasy. Nedvidek had been an editorial cartoonist in college, which made the graphic novel format a natural fit. And Lowe had an interest in “inventing machines that don’t exist but could have,” leading to the unusual art and machines found within the tale. The trio’s unique interests, along with their shared love of movies and entertainment, helped fuel the story’s progression. To corral their ideas, the three split up the work and used a democratic process to ensure the story flowed smoothly. Working around their full-time gigs, the team met weekly to flesh out the story and finish the writing. Nedvidek made weekend research trips to Jekyll Island, photographing landmarks, checking facts and bringing back inspiration. The project got a huge lift when the authors connected with students from art and design school, Savannah College of Art & Design (SCAD). The school created a special class for the book in 2013, assigning 10 students from the School of Sequential Arts to help visualize the story as the authors worked out the plot. Two of the students, J. Moses Nester and S.J. Miller, continued working on the book after graduation and they are credited on the final product. 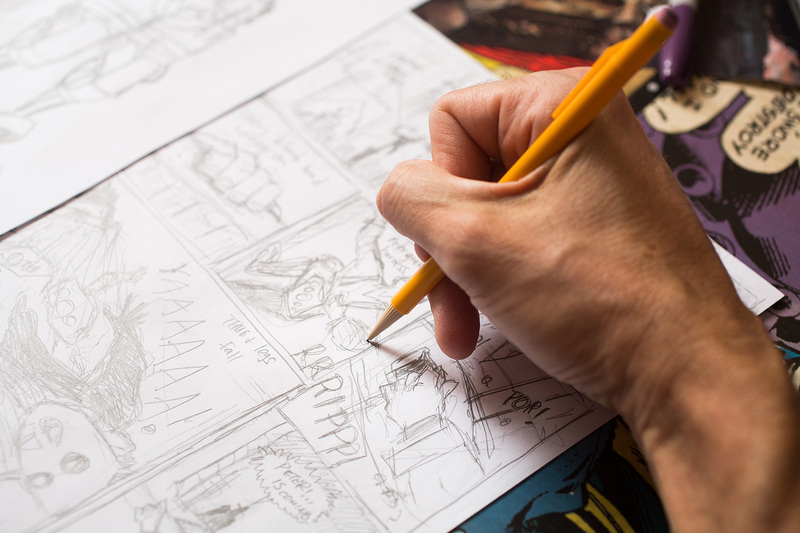 “The SCAD connection really pushed us to start writing quickly, so we could stay one step ahead of the artists,” Lowe says. Soon after SCAD was on board, the co-authors landed interest from publisher Top Shelf/IDW in July 2013. 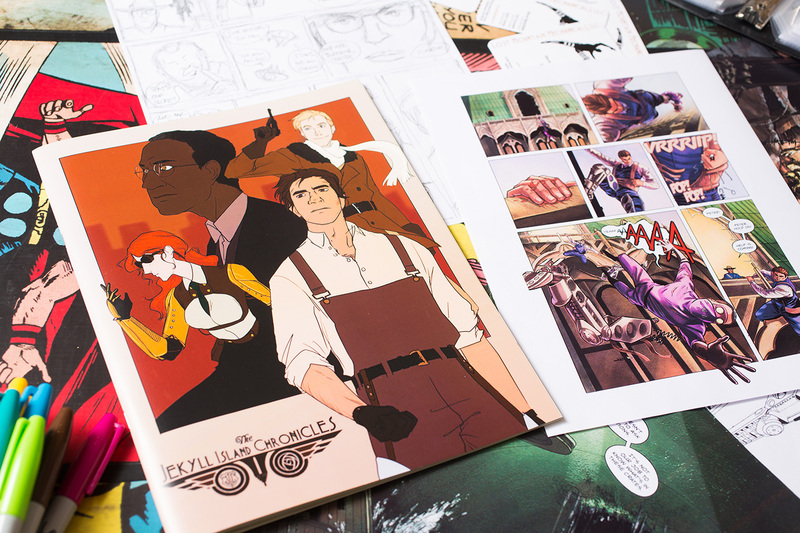 “The SCAD students developed a pitch packet for us to share with publishers and production people,” recalls Nedvidek. The authors reviewed a list of publishers compiled by the students and noticed that one of them, Chris Staros from Top Shelf Productions, was local. Steve connected with Chris over lunch and had a green light the next day. “Chris said he wanted to keep the whole thing in Georgia, which was a great vote of confidence to the team,” says Nedvidek. With a book deal in sight, the authors spent all of 2014 completing their draft. They launched a Kickstarter campaign in 2015 that helped them attract start-up funding for the rest of the series. The team, still energized from their May launch, says it wouldn’t be possible without the support of family, friends and co-workers. Now they hope their success will serve as an inspiration for others to follow their dreams. 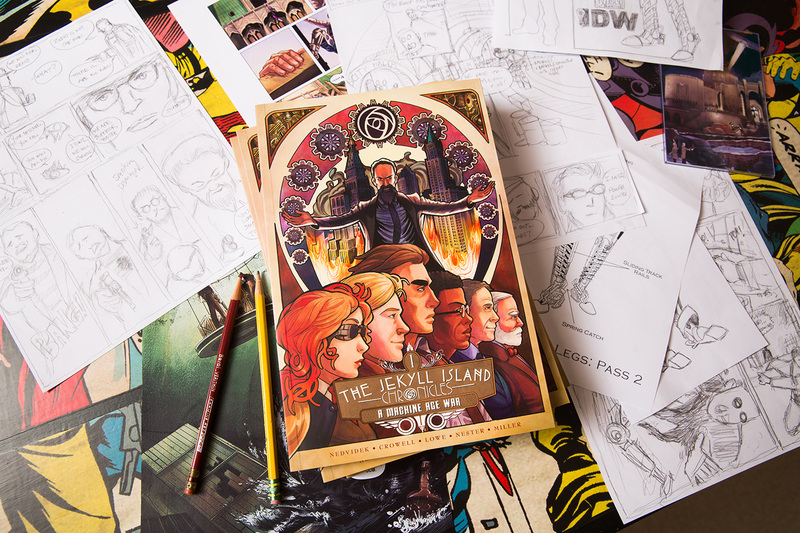 Nedvidek, Lowe and Crowell head to San Diego this month for the annual Comic-Con International convention, a smorgasbord of comics, movies, TV, costumes and everything in between that will put the The Jekyll Island Chronicles in front of more than 160,000 fans. They will be tracking their adventures on Instagram, Facebook and Twitter. Not too bad for a few guys chasing a dream…to be continued. No doubt.